← Israel Cowardly And Reckless, But Hasn’t Attacked Syria Lately. Here’s Why! “American elections are a farce. A scam. Rigged. Unrepresentative of the desires of the people. A show for main stream media to justify their existence,” Hoenig told Press TV. “Even if today’s election has a larger than expected turnout, it still is unlikely to represent a majority of eligible voters. Those who do not vote are not necessarily apathetic, nor are they uninformed. Many work and cannot take off. Today is not a national holiday. It is only a state holiday in 11 states. The vast majority of eligible voters are not registered as either Democrats or Republicans and the percent of all who support third parties is in the 60s,” he stated. We often think of how the Republicans are so good at rigging elections, especially through their control of the voting machine. Was it Stalin who commented that it’s not how many who vote but who counts the votes that matter? As it was also attributed to either Mark Twain or Rosa Luxemburg who said if voting mattered it would be illegal. But it was Hillary Clinton and the DNC that completely rigged the Democratic Primary system to steal the nomination away from Sanders, who most likely would have made mincemeat out of candidate Trump. Hillary gave us the Orange Buffoon,” the analyst noted. “Voting is viewed as a fundamental right of citizenship. Yet millions of people of color are denied such a right. In North Dakota, native indigenous populations, living in prisoner of war camps (reservations) are denied the right to vote because they don’t have a street address,” he said. 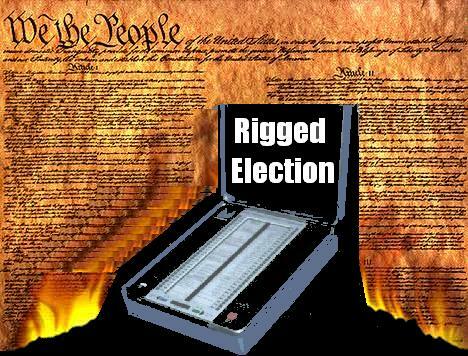 “In each state, it is either the Democratic or Republican machines that control how elections are carried out. The procedures for a third party to even be on the ballot can be onerous. In Maryland, for example, a state-wide candidate for a state position, not federal, must garner at least 1% in order for the party to retain ballot access,” he said. “No such rules apply to the Democrats or Republican parties, as they control the process. Otherwise, they are required to collect signatures for a petition by registered voters if they don’t meet that 1 percent threshold. Each state has its own rules regarding such ballot petitioning, and some are nearly impossible to meet,” he added. “Those with the power to control our economic forces set the conditions for elections. The banks will be saved and protected. The war industries will go on like never before. Health care, the #1 concern in America, will remain controlled by the insurance industry. Labor unions will remain under the thumb of the Democratic Party and main stream media will make sure real challengers are ignored,” Hoenig concluded. This entry was posted in News and politics and tagged American elections, farce, not representative, Rigged, The Banks saved. Bookmark the permalink.